This idea is by no means original, but this is a prototype of a design I’ve wanted to try for a while. These aren’t currently available to be ordered, but maybe one day in the future I’ll add this style to my online store. The handle is 16.5″ and turned on the lathe from laminated Padauk and Oak blank with an Aussie style keeper attached to the handle instead of the traditional cow whip cup. The thong is a standard nylon stockwhip style. My method of tying on a cow whip handle. I get questions in this because it’s something I left out of my whipmaking DVD. I hope it helps. Kelley Performance Whips are here! 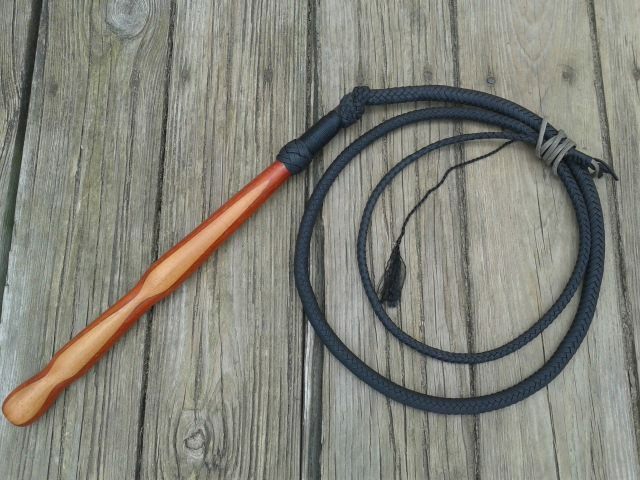 A recent twist on the time tested Florida cow whip design are the so-called “pipe whips.” To my knowledge, these whips were first introduced by a whipmaker named Chris Hall and later popularized by Lauren Wickline of Midwestwhips. Since then, the design has been copied by many others. Now this design is finally available from one of the most trusted name in synthetic whips –Rhett Kelley Whips! Get the first one FREE! If you are interested in being one of the first to own a Kelley Performance Whip -and get it FOR FREE– visit the KPW page at my website for more details and to enter. Drawing will be held on Oct 14th, just after noon. For a whipmaker, having a long list of orders to make is a good problem to have. It means you’ve got plenty of work to do and your name is out there and your work is in demand. Since going full time, I’ve had as many as 75 orders to make and seldom less than 40. At times it can be a bit overwhelming. The bad part is having to tell people that you don’t have any whips in stock and they will have to wait. Worse than that is having to tell people who have been waiting that they will have to wait longer because 2013 has been so bad for your family with multiple deaths, illnesses, and hospitalizations. Whereas I once waited to receive payment until I started making the whip, in 2012 I moved to be more in line with most other whipmakers and started requiring payment for orders up front. This move eliminated the trend I had noticed for many years in how people would order whips and then forget about it, or disappear when it was time to pay. With that change, I made sure to update my policies to reflect that a prepaid customer is free to change or cancel their order at any time while they wait and that the customer would receive a full refund. That change has worked very well. So far, not a single prepaid customer has forgotten about their order or disappeared. I have many to change their order, and less than 5 actual cancellations. Last night I checked my email before I went to bed, I had an email from Paypal with something I never expected: A customer who had only been on the waiting list for one month went through to credit card company for a “charge back.” He claimed his order was “unauthorized charge.” Frankly, I was quite taken aback. I saw nothing weird about the order on my end when it was placed. He even emailed me asking how long the wait would be for the whip. After that, there was no communication whatsoever. I never saw this coming. While I suppose it is possible someone used his card to make an unauthorized charge, it certainly wasn’t me! If this guy desired to cancel the order, he was free to do so and I would have cheerfully obliged. Unless this was a legitimate case of ID theft, the way this was handled was tantamount to a landlord sending the police to collect the rent from a tenant who wasn’t even late -without ever having attempted to collect it first himself. If the buyer in this case was legitimately defrauded by someone, he has my sympathy. If he was simply lacking in tact and common decency, I’d rather not do business with him anyway. 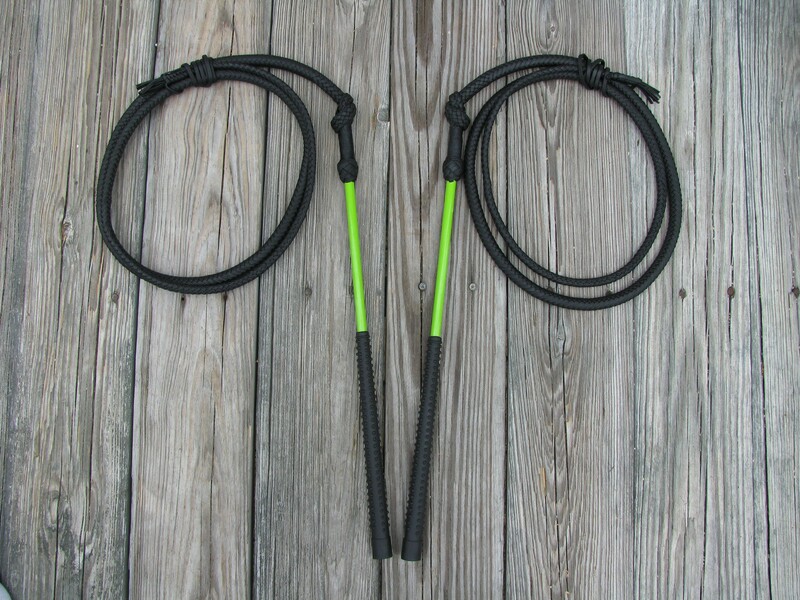 Win a Performance Cow Whip! I announced on Facebook last week that I am planning to throw my hat into the ring and start producing the ever-popular “pipe whips” popularized and marketed by Lauren Wickline as Performance Hybrid Stockwhips. I haven’t began working on my design yet, but when I get it completed, I am going to give it away in a drawing. The title of this post is a question I’ve gotten a few times lately, so I figure it was about time to address it here on the blog. The fact is, I do not offer a discount on matched sets, there’s actually a fee associated with it. 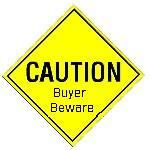 At first glance it seems odd because it is common practice for sellers to offer discounts for multiple purchases. Such is the case with many of the beekeeping supply companies I deal with where the more of an item I buy, the less per item I pay. So in light of that, I realize it may seem counterintuitive to people that I would charge more for a pair of whips. The reason why I charge more for matching a pair of whips is simple: it takes much more time and focus to make a matching set of whips. I’m not sure how others do them, but for me, making a set of whips match is not as simple as just making two whips back to back. When I make a matched set, I spend much more time on it and it is more painstaking because I really try to get the whips to be as matched as possible. This means I’m constantly going back and worth between the two, repeating every step as closely as possible. Every step is worked, compared, and sometimes reworked. It’s lots of work… Or, maybe I just stress out about it more than some. Here’s an example: Right now I have a matched set of 8ft, 16 plait bullwhips on my waiting list. I can make one 8ft, 16 plait bullwhip in a day; two of them in two days, but because it’s a matched set, I’m pretty sure that this order could end up taking me three days. To me, it is only logical to charge a little more for doing a job that will require even more time, skill, and focus to accomplish. I try to keep it reasonable; the most I charge extra is $75.00 for most types of whips and just $25.00 extra on a set of FCE stockwhips because the handles are prefab and I only have to handcraft and match the thongs. Again, I realize that some may disagree with this policy and that’s okay. I hope that this article will give folks some incite as to why I do charge more on matched pairs. It has nothing to do with being greedy or wanting to discourage two-handed whip cracking. Thankfully the online whip market is still very much a free market, so no one is forced to buy anything. Those who see the value in what I do will have no problem paying what I ask, those who do not see the value will go elsewhere. Either way, no one is being defrauded.